California dairy farmers are exploring ways to expand the use of manure and help the state meet its healthy-soil goais. During his first few days in office, California Governor Gavin Newsom noted that healthy soils are important and an “interesting passion” of his. His words confirm that the state will continue to support farmers and ranchers in nurturing the soil through sustainable practices, an effort first codified by Governor Brown in 2015. 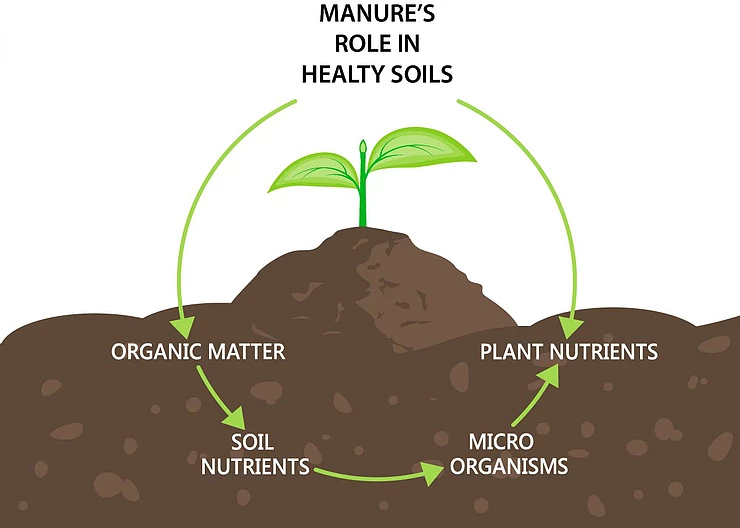 Through a collaborative effort known as the Healthy Soils Initiative, state agencies and departments, led by the California Department of Food and Agriculture (CDFA), have been working to promote practices that contribute to building soil organic matter. The state’s dairy farmers share a common goal and the potential to help build healthy soils on their farms and beyond. Increasing soil organic matter helps boost the amount of greenhouse gas emissions that are captured and stored underground (via plants and microbes), while providing numerous other benefits, including increased water holding capacity, higher crop yields, and reduced erosion. Research has shown that numerous agricultural practices—including compost application—can help build soil organic matter and store carbon underground through a process known as sequestration. With this science in mind, California’s dairy farmers are not only making ambitious strides to reduce greenhouse gas emissions to unprecedented levels, they are also aiming to further contribute to carbon sequestration. The state’s dairy sector is currently working with researchers, non-governmental organizations, and technology providers to explore ways to expand the use of manure nutrients in ways that help sequester carbon. California dairy farmers have long been applying manure as an organic fertilizer when growing forage and grain crops that are fed to cows. Now, dairy farmers are looking for new ideas in which manure-based soil amendments can be used to grow other crops. For example, dairy farmers recently pledged to support a research proposal, which will examine how manure-based products can be utilized to build healthy soils in orchards. This research would investigate a vast opportunity to improve soils on millions of acres across the Central Valley. However, much more research will still be needed to fully explore how a long list of technologies and strategies could potentially serve the needs of California’s farmers. While some dairy farms already sell composted manure to neighboring farms, the potential for manure to serve as a high-value soil amendment is still widely untapped. Avenues for marketing manure-based products are currently being explored through a project funded by the California Dairy Research Foundation. The project aims to better understand the soil amendment needs of farmers across the state and the potential to serve those needs with manure-based products. This knowledge will help the dairy sector better understand how to guide the development of research and technology to promote recycling and re-purposing dairy manure in a way that is most beneficial to all Californians. Working collaboratively, dairy farmers aim for optimal synergy between efforts to manage manure in ways that best protect water and air quality, contribute to healthy soils, and work toward the state’s dairy methane reduction goal. For example, practices currently incentivized through the Alternative Manure Management Program (AMMP) promote dry handling of manure, which can be a significant first step in producing valuable and exportable manure-based products. Additionally, the state’s growing number of dairy digesters produce renewable energy while also creating a form of organic manure nutrients known as digestate. The digestate can be utilized for growing feed crops on the dairy farm or further processed to create a value-added, exportable product. The California dairy sector continues to participate in the ongoing development and evolution of state incentive programs to ensure that all efforts to reduce greenhouse gases are best aligned with the goals of building healthy soils across the state and improving water and air quality. While there are still many challenges to overcome, the momentum is strong among dairy farmers, state officials, and non-governmental organizations. The state’s dairy leaders are also collaborating with national dairy leaders to explore cost-effective strategies for improving the role of manure nutrients in sustainable farming practices. With a Governor who’s passionate about building healthy soils and fighting climate change, there is strong potential for California—the nation’s leading agricultural state—to help pave the way in maximizing the environmental benefits of dairy manure nutrients. California dairy farmers will continue partnering with researchers and the state to make an underutilized resource an important part of a healthy-soil future.